The first in a page-turning young adult fantasy series perfect for fans of Victoria Aveyard's Red Queen and Sarah J. Maas's Throne of Glass series. The only reason it took me nearly three weeks to finish this book was because I was constantly trying to keep up with my university work while also balancing other responsibilities at home with my family. I definitely found this book to be absolutely refreshing and delightful, although the overall feeling I got when finishing was between a happy but bittersweet ending and slight dissatisfaction. I had originally requested a review copy from Hachette New Zealand because I found the cover to be thoroughly enticing and the synopsis had given me Throne of Glass and Red Queen feels. It definitely lived up to my expectations but failed to soar beyond that point. Really I'm just trying to say that this was just an enjoyable read for those looking for something that will definitely be interesting and a safe read if you're trying to avoid or get out of a reading slump. Preferably also for those that might be new to YA fiction and need something that would introduce them to what we harbour in our little world of fantasy. "The book says that a west wind will blow when the child of light is born, a powerful Fireblood who will fight the darkness and destroy it forever." Ruby Otrera was a character that I liked almost instantly because of her fiery (no pun intended) attitude and soft heart (for the things that meant most to her like her mother or learning how to heal using herbal remedies). When the Frost King's soldiers come to take Ruby for being a Fireblood, they kill her mother and lock her away where she is kept isolated and weakened with cold buckets of water, until she is saved by a very powerful Frostblood monk and a mysterious young man, who also harbours a rough attitude, who goes by the name, Arcus. I felt like this story was very well written considering the characters back stories and motivations, and Ruby definitely gave an all round convincing performance as a young girl with little control over her Fireblood power. 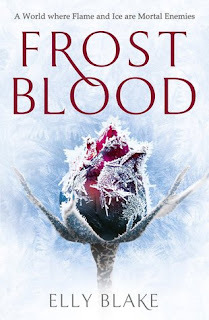 Having the monk, Brother Thistle, and Frostblood warrior, Arcus, there to convince Ruby that her power is most likely the only way to defeat the Frost King and melt the Ice Throne, which supposedly holds a dark power that influences the mind of whoever sits on it is a great motivation for her to stay and prove that she can begin to wield her fire with absolute precision. This comes with a lot of training involving peaceful meditation and even a bit of sword fighting, which is a nice twist considering a lot of fantasy heroines who wield magical powers only stick to training with that power. If you consider Celaena Sardothien from Throne of Glass, she was already a trained assassin before she started learning to wield her power, so having a protagonist who has absolutely no knowledge of how to fight is a nice change. "You don’t know the effect your words have on me, Lady Firebrand. It took years to build up this ice. You will melt it and then I will be broken." The descriptions are vividly written and the fight scenes are simple but effective, plus I love how the castle of ice and throne with darkness inside was described. I really felt submerged within this novel - it is definitely a beautifully written story, however I would have liked if there were more information regarding the back stories of their people and their Gods and Goddesses. I know that some fantasy treads lightly considering the lore since it can get super detailed and too much to handle without a whole seperate handbook of information, but personally I love the heavy stuff. Maybe in the future something like that would be released and I would just fall in love with this series even more! "But history could be twisted and warped to suit the person telling it."